If your dog is lost, you need to act immediately and with a firm plan before he strays too far, is overcome by panic, or is injured in traffic. Dog owners think their dog will come back on his own but you really need to read this! WILL YOUR DOG GET LOST? Vacation time is a risky time for dogs. If your dog runs away, an identification tag on your dog's collar is the best way to get your dog back. The tag should have the following information on it in this order: Your dog's name, "If lost please call": (your number with the area code) or local police. This way if your dog is lost outside your area, you can notify the local police. The person who finds your dog can also call the police. While you are looking for your dog, the police can receive a phone call. If you have a phone answering machine, know how to use your remote access. This way you can check your home number to see if anyone calls with information about your dog. Do not rely on the license tag or the rabies tag for identification. Those people are not at their jobs on weekends, at night and are not a reliable source of information about your lost dog. Of course, an ounce of prevention is worth a pound of cure. You never tie your dog up while you go swimming or partake in other summer activities. Instead, arrange to safely board your dog for a day or so while you picnic or swim. 1) If you organize a group of people to look for the dog, use all safety precautions so that the searchers do not become lost as well. Stay in touch using cell phones or hand held radios. The radios can be purchased for a nominal fee at any store that sells outdoor equipment. Radios will work in areas that cell phones may not, however, they have a limited range so be sure that a chain of people can relay messages over distance. Also, establish radio protocol so that one person does not tie up the frequency preventing communication with others. Communication is essential to let the other searchers know what is going on, if the search is being suspended, or the dog has been found. Because people feel safer and calmer if they know what is going on, this will allow the searchers to do a better job. Be sure that searchers wear the appropriate clothing, (long pants and long sleeves), hats, and substantial footwear. They should have a snack, water and a flashlight. Flashlights are necessary during the day to check dark places. Each searcher should have a small bowl and water for the dog, as well as canned cat food with the strongest aroma, (or a similar treat) to lure the dog. Small cans of cat food work well because they can be carried easily and kept fresh. Searchers should always work in pairs for their own safety, and in the event two people are needed when the dog is found. A meeting area and time should be established in case communications break down. No one should leave until all are accounted for. 2) A dog that is frightened will bolt in any direction, but usually to the least noisy, darkest area. Given the choice of an open field or woods, the dog will go for the woods. If the dog is lost in the city or suburbs, the dog will look for a dark, quite spot to hide after it has run to exhaustion. Therefore, try to estimate how far the dog will run (this varies with the dog’s size and condition) and add a mile to that. On a map of the area mark where you last saw the dog as the center of a circle and draw a perimeter around that point, based on the furthest point where the dog could be. The circle will encompass the area to start looking for the dog. If you saw the dog run, you can focus in that direction. Be sure to check small dark areas: under porches, stairs, garages, sheds, etc. If you have a number of people helping to look, have some start at the perimeter of the circle and some from the center. Be sure to look for the dog, never assume that the dog will come when called. 3) If a dog runs away, they usually run into the wind. That means that the wind will be blowing toward the dog, into the dog's face. Check with a local airport to see what the wind direction was when the dog ran away. Then start looking into the wind from the point where the dog was last seen. Dogs who wander away will usually meander along unless they find something to chase or something that interests them. This means that the search area will be smaller. If searching in the woods or a park, look for a game trail and look for fresh dog tracks to see if the dog went that way. If you do find tracks, you will not be able to tell for certain if they are from your dog, so do not give up searching the rest of the area. If you are searching in an urban or suburban area, listen carefully if neighborhood dogs are barking. Often they will bark at a stray dog. If you hear a lot of barking in one direction, check that area first. 4) When searching for a dog, travel slowly and make frequent five minute-long stops. Many people will drive around in a vehicle, calling to the dog. Unless the dog is within a few seconds of your location, he will not be able to find you if you move too quickly. Keep in mind that a dog can hear you calling from quite a distance away. They need time to determine the direction of the sound and then get to it. Wind and other environmental elements can distort the direction of sound (tall buildings, large hills, etc.) making it difficult for the dog to find the source of the sound. By stopping and continuing to call for about five minutes, the dog will have time to find you. 5) When you sight the dog, do not act excited and/or run toward the dog. Sit down or stand still and let the dog approach you, even if it is your dog. Sometimes a dog can become so frightened, hurt or weary that they may not think straight. Their survival instincts may take over, making them more cautious than they would be at home. Depending upon the direction of the wind, you could be downwind and the dog may not recognize you right away. Give the dog time to feel safe. Running to the dog may make him run away from you and lose what little trust in humans that he has left. If you feel it will work, you can, at a distance, slowly move so that you are upwind of the dog, and then open the can of cat food, but still let the dog come to you. When the dog comes to you do not try to grab the dog. Let the dog stay there and relax. Slowly pet the dog until you can attach a leash without frightening the dog. If the dog does not want to be caught, you will most likely not be able to grab the dog fast enough to catch him, even if he is next to you. Dogs are about 500 times faster than humans. 6) If the dog does not approach you, do not give up. Stay in that area and/or return to that area. You can leave food etc. but do not try to catch the dog. 7) If you leave food for the dog, do not assume that because the food was eaten that it was eaten by the dog. Other critters may eat the food, so continue to search the area. If you can, spread sand around any food that you leave so that you can check for footprints to determine if a dog ate the food. If sand is not available, loose soil will work as well. 8) If you have to search for the dog over a period of time, keep a log of the weather and the location of water sources. The dog will generally head into the wind and seek water. 9) Never forget to advertise. Use every means possible to let the people in the area know that there is a lost dog. Always have an up-to-date photo of your dog. If the dog is a breed that looks like others in the breed, a similar picture will do. Remember, the average pet lover will not notice the fine differences between your dog and others of the same breed. So do not panic if you do not have a recent photo. Be sure to expand the area that you advertise to at least five miles from the point where you last saw your dog. 10) Lastly, never give up. Dogs have been found months after they disappear. 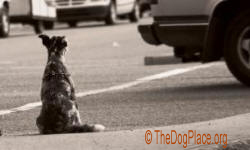 See TheDogPress.com for what to do when you FIND A LOST DOG? How to safely approach and transport it, locate the owner, etc.